… But let’s not get ahead of ourselves, because it would be rude to pass judgement without considering the facts. Creative is one of the biggest names in computer audio, with a history that includes the legendary Soundblaster audio card and a host of portable music players. 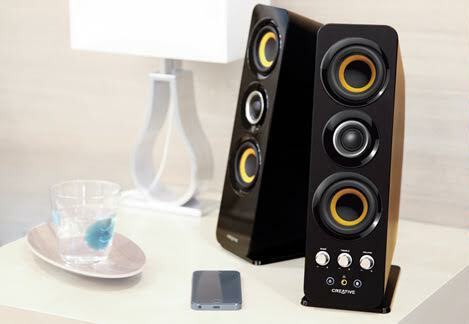 Back in 2008 it released the T40s, a hefty set of stereo desktop speakers featuring two mid-range drivers, a dedicated tweeter and a resonant bass chamber in each unit. The T40s reviewed pretty well, fast becoming a mainstay of Creative’s desktop range, and inviting comparisons with big audiophile names like Bose. In a nutshell, the T50s are more of the same. Like their predecessors, they’re big, meaty and powerful. However, this time they come with extra connectivity. As well as the traditional wired connections for computers, TV and hi-fi, you also get a one-touch button for Bluetooth pairing. And, if you have a new-fangled NFC connection on your phone, you can simply wave your device at the right speaker to make beautiful music emerge. It’s a miracle of science. The T50s have benefitted from a yellow-and-silver facelift, but the handiest features of earlier models are still present. A front-mounted control panel allows you to tweak the sound levels, while an inbuilt headphone jack should mollify the most sensitive of neighbours. And, as with most Creative gear, build quality is excellent. The entire set has a luxurious feel, with high-quality woven glass for the midrange drivers and silk cones for the tweeters. 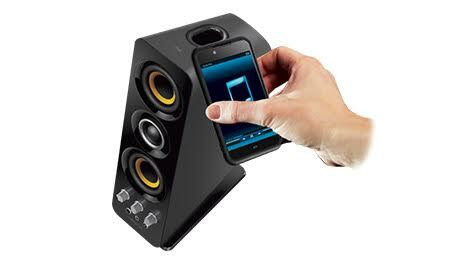 On top of this, I can personally attest that the speakers are solid enough to withstand an accidental drop or two. Now seems a good time to return to the views of my sonically gifted friends. Even with the speakers barely out of the box, one thing was immediately obvious: the T50s are all about the bass. Unless you take steps to control it, Creative’s inbuilt Bass Xport technology tends to take over, muddying the otherwise-warm midtones and overshadowing the vocal range. Thankfully, this can be remedied with a combination of the on-speaker settings and your app’s graphic equaliser, but you’ll definitely have to do some tweaking if you want to tame the low-end and make the T50s sound their best. 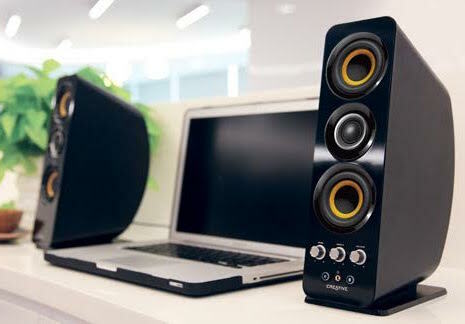 It’s a completely different story when the speakers are hooked up to a computer, where anything in the high-midrange – including game sounds and most day-to-day audio - sounds incredibly crisp and precise. And, even with the bass turned right down, the presence of two big speakers a few feet from your face creates an almost visceral sense of being in the action. Although they can’t reproduce the sense of scale that you’d get with a really good subwoofer, the stereo-only T50s are still great at bringing games to life. Creative have a long and illustrious history of producing desktop speakers and, in the end, that’s where the T50s really shine. I’ve got no hesitation recommending them as a competent and pleasing mid-price choice for computer audio. For general-purpose listening, however, the story is more mixed. If you want the same excellent results when listening to music, or watching TV, the T50s can and will deliver. You’ll just have to work a little harder to make it happen.